Wild carrots, Daucus carota. Norfolk, UK. Photo: Paul Kirtley. The wild carrot, Daucus carota, is a widespread and relatively common species, native to Europe and Asia. It has been introduced and naturalised in Australia and North America, where it is often referred to as Queen Anne’s Lace. This species also lends its common name to what is often referred to as the carrot family, of which it is a member. The scientific name for the family is Apiaceae. This family contains many edible wild species such as pignuts, Conopodium majus, wild angelica, Angelica sylvestris, hogweed, Heracleum sphondylium, alexanders, Smyrnium olusatrum and ground elder, Aegipodium podagraria to name but a few. The carrot family also contains many familiar cultivated and economically important species such as cultivated carrots, parsnips, celery, fennel, parsley, coriander and caraway. The family is not to be taken lightly, however, as it also contains some highly toxic species, specifically hemlock, Conium maculatum, hemlock water-dropwort, Oenanthe crocata and Cowbane, Cicuta virosa. 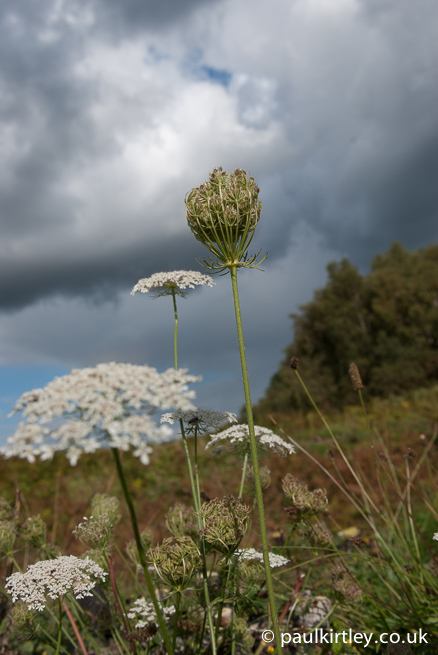 What makes the Apiaceae particularly tricky is that the edible species often share many similarities with their highly poisonous relatives, notably white flowers clustered into umbels, pinnately divided leaf structures and tapered, tuberous roots typified by parsnips. Umbel of wild carrot, Daucus carota. Campania, Italy. Photo: Paul Kirtley. Umbel of hogweed, Heracleum sphondylium. County Durham, UK. Photo: Paul Kirtley. 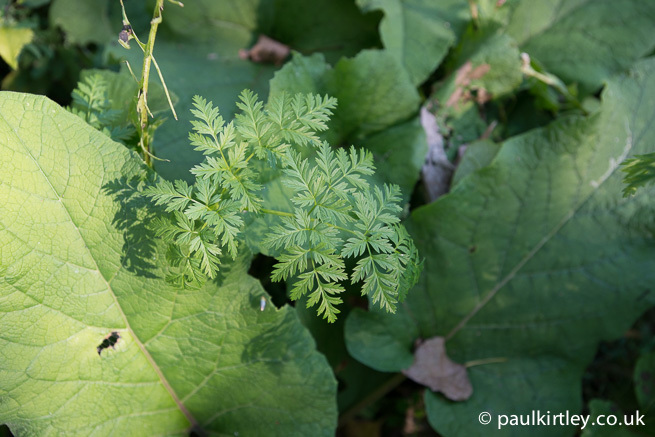 Umbel of ground elder, Aegopodium podagraria. East Sussex, UK. Photo: Paul Kirtley. Umbel of water parsnip, Sium suave. Ontario, Canada. Photo: Paul Kirtley. Even if you know these plants well, just how much care you need to take was highlighted to me on a recent trip to Italy. We’d been invited to a wedding in a rural Campania, about two thirds of the way from Rome to Naples. Our accommodation was part of a farm complex which produced mozarella cheese and cured hams. We ate well there and I certainly didn’t need to forage from the surrounding countryside! Always curious, though, on the day after the wedding, I went for a walk around the place to see what interesting trees and plants were growing wild in the vicinity. What caught my eye first was that there were a lot of wild carrots growing in the area. Wild carrots growing on the farm, Campania, Italy. Photo: Paul Kirtley. As I dropped down towards damper ground, though, what then caught my eye was that there were also hemlock plants growing here. In fact some were were growing right next to wild carrots, while others nestled amongst burdock, Arctium lappa. 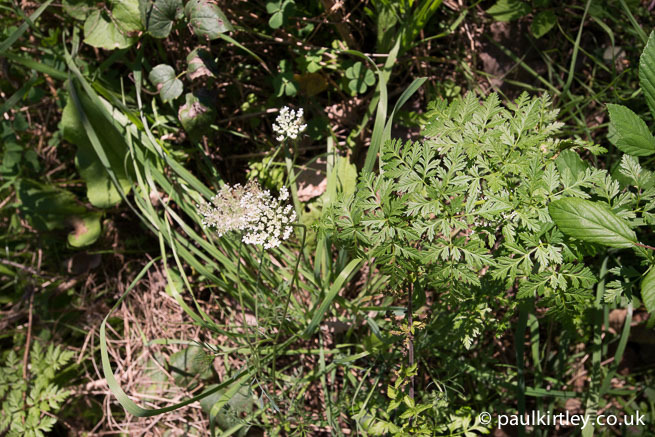 Wild carrot on the left of the picture; Poison hemlock on the right. Campania, Italy. Photo: Paul Kirtley. While I didn’t start digging on this occasion, I know that both species have similar roots. To most people, both would look like a small parsnip. The wild carrot root is not orange like its cultivated cousin. This just highlighted to me, once again, how careful you need to be in extracting the roots of carrot family members for food. You need to make sure you positively identify the aerial parts of the plant and ideally still have them attached to the root when you extract it. 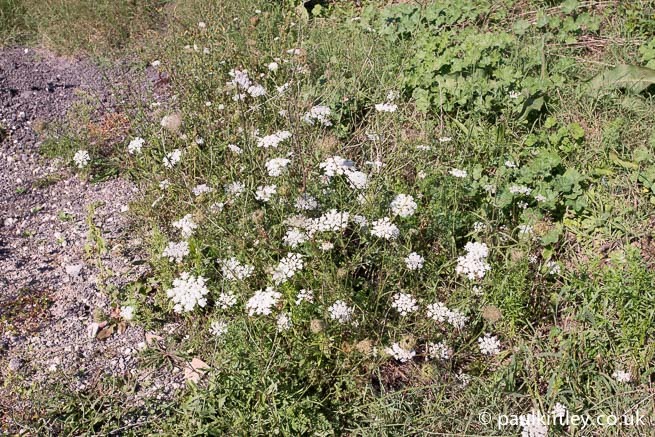 Here, on this patch of land in Italy the roots of poison hemlock were literally within inches of the roots of wild carrots. Hemlock has hollow, hairless stems with purple blotches. 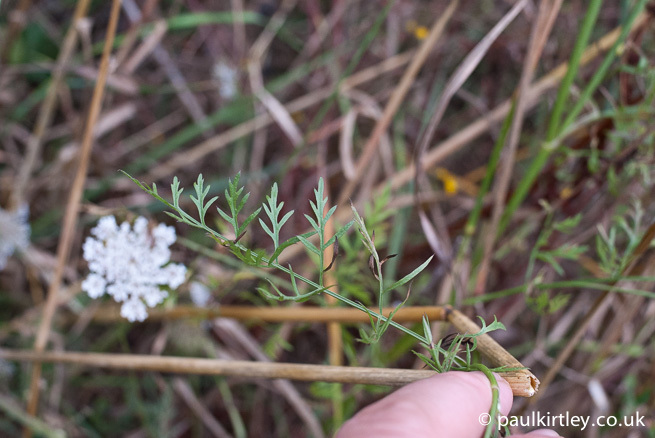 Wild carrots have solid, hairy stems with no blotches. 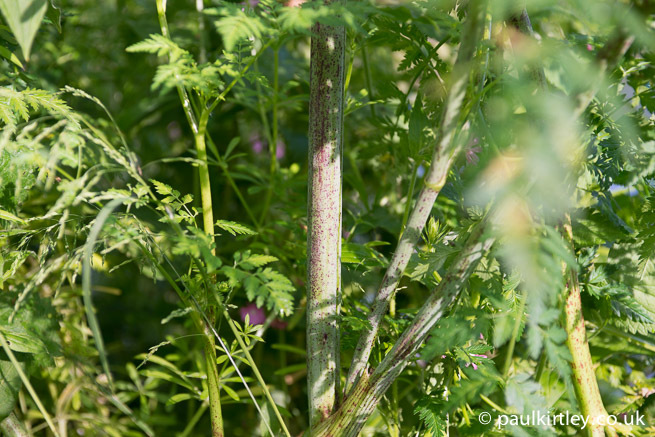 Wild carrots often have a single purple flower at the centre of their umbel. Hemlock does not. The bracts of wild carrots are large and at least branched into three forks at the end, if not pinnate. The leaves of wild carrot are quite fine and lacy, reminiscent of the leaves of pignut, Conopodium majus, whereas the leaves of hemlock are more like those of cow parsley, Anthriscus sylvestris. Purple blotched, hairless stem of hemlock. Derbyshire, UK. Photo: Paul Kirtley. Solid, hairy unblotched stem of wild carrot. Campania, Italy. Photo: Paul Kirtley. Hemlock has a hollow stem. Photo: Paul Kirtley. 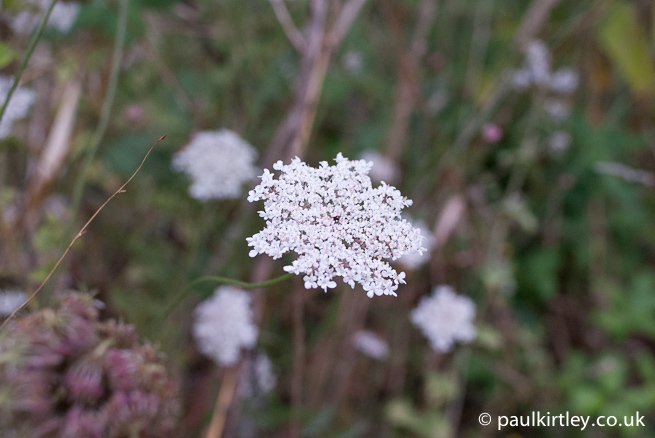 Note the single, purple flower at the centre of this wild carrot umbel. Campania, Italy. Photo: Paul Kirtley. 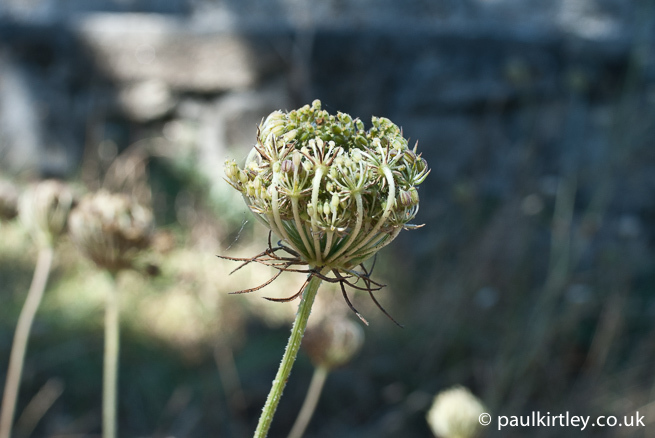 The large, three-forked bracts can be seen at the base of the seed head of this wild carrot plant. Galicia, Spain. Photo: Paul Kirtley. The fine, lacy leaf of wild carrot, Daucus carota. Galicia, Spain. Photo: Paul Kirtley. Leaves of hemlock, Conium Maculatum. Campania, Italy. Photo: Paul Kirtley. 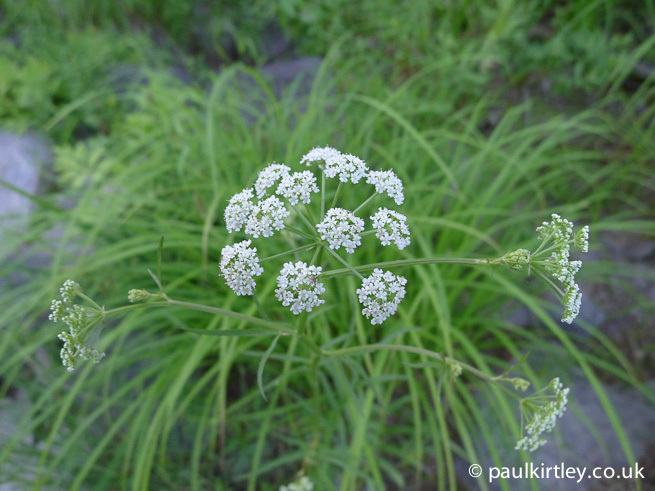 Do either wild carrots or hemlock grow in your area? Or have you seen these species in areas you have visited? Let me and other readers know in the comments below. You should know the law with respect to picking wild plants and respect people’s private property. Thank you Paul, a great read as usual! From the pictures above I believe we have an abundance of Wild Carrots in our area (South Wilts) I noticed them mainly when searching for Pignuts which i haven’t seemed to be able to find here! I will certainly be looking for these on my next trip out, do you have pictures showing the similarities/differences in the root structure of the Wild Carrot/Pignut/Hemlock etc? Both hemlock and carrots have a similar shaped root and I would always look to the aerial parts for positive ID. Remember if you dig up a parsnip-like root, there are many other plants in this family it could be, not just either of these two. Smell is a good indicator – , when bruised the green parts as wekk as the roots of wild carrots smell like carrots. ; Hemlock on the other hand smells unpleasant and fusty. Some people say it smells like mouse urine but I can’t say I have much experience in sniffing that! Cheers for the advice, i am acustommed to the “Mousey” smell! to that end, knowing the wild carrot smells akin to the cultivated carrot is a big help. 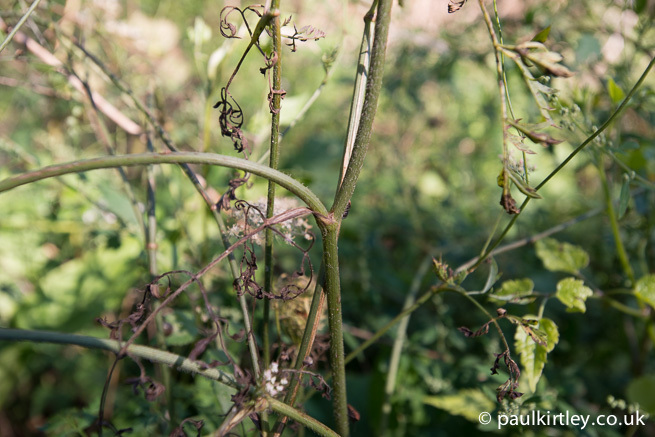 Hi Paul, thanks for the article – it’s quite scary really how simular these plants are. I tend to keep well away as the thought of picking the wrong one worries me a bit, I have done a basic plant foraging course but still do not feel confident to go alone. I couldn’t agree more – if in doubt, leave it out. But knowledge starts with awareness. And once you are aware of the trickiness of this family, you can get to know the identification features over time. I know we have lots of what I thought was wild Queen Anne’s Lace blooming right now near my house in the North Georgia mountains. I will need to examine them closely to see what they really are. i have seen fennel,wild carrot and hemlock growing where I walk. Thanks for letting us know what you’ve seen in your area. I’d be wary of just lopping off bits of yew for a bow. You won’t find the right type of wood on a branch or similar. You really need a section from the trunk of a tree, where you obtain a natural laminate of the heart wood and sap wood. Yew trees grow so slowly, I would not advocate harvesting anything sizeable yourself. A decent sized tree will be hundreds, if not thousands of years old. If your grandson really wants to make a bow from yew, I would recommend sourcing a seasoned stave from a reputable supplier. If your grandson has not made a bow before, I would recommend starting with making an ash bow and go from there. It’s good to hear from you. Thanks for the insight into your foraging walks. Interesting that despite you being such a long way from where we are here in Europe, we are discussing the same species. Yes, introduction plays a big part but also the resilience and success of the species in question. I’m glad to hear you have access to some good wild food resources where you are. It also reiterates that you should start from a point of solid knowledge work outwards from there. I also like the fact that you have emphasised the role of your sense of smell in identification. It’s very important that we engage all the senses, not just our visual sense. Hi Paul. Thanks for your last article. Useful as usual! If I’m not too intrusive: where exactly were you? I was born in Campania!! Nice to hear from you. We were near Vairano Patenora, south-east of Cassino. Wow World isn’t that big. I live 45kms north from there!!!!! Hope to meet you next time you’ll come here in Italy. 🙂 Yes, it does seem to be a small world. Thanks for another great write up and photos, Paul. Talking about using the sense of smell reminded me of a recent fungi foray. The guy taking us round seemed to spend as much time sniffing the fungi as in looking at them and their location. I tend to forget to use my nose and will try to remedy this. Regards, Ian. Yes, smell is critical with much fungi identification. 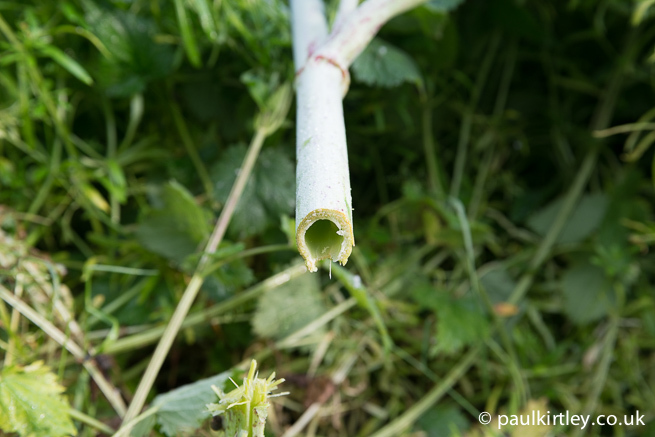 You may find this thread I started a few years ago, (about two Umbellifers) interesting, esp the comments..
To of used the word “kill” may have over done it, but it could.. Thanks for the link. I’ve just read the thread with interest. There’s a lot of both HWD and angelica in the area I run courses, so I’m familiar with both. And familiarity is the key. As you know, one has to spend time observing these plants through the seasons to know them well. I don’t think you overdid it with the use of “kill”. 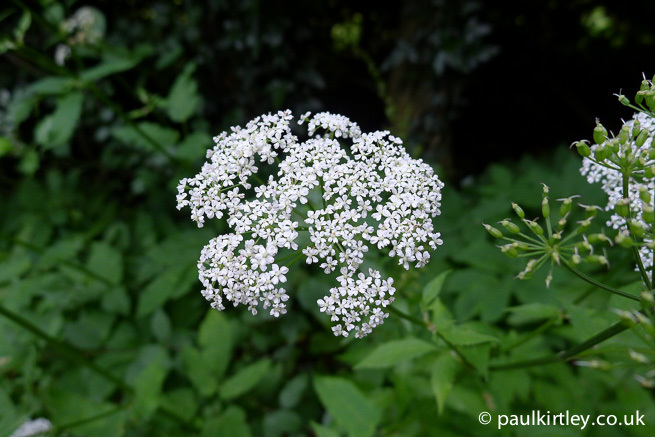 There have been fatal poisonings from hemlock water-dropwort and some very near misses too. Good stuff Paul,-comprehensive info and useful supporting photos. Umbelliferae are tricky buggers aren’t they! Thank you for the interesting article. It is especially useful that you also included the scientific botanic names. This makes it easier to identify the plants when looking for additional information. 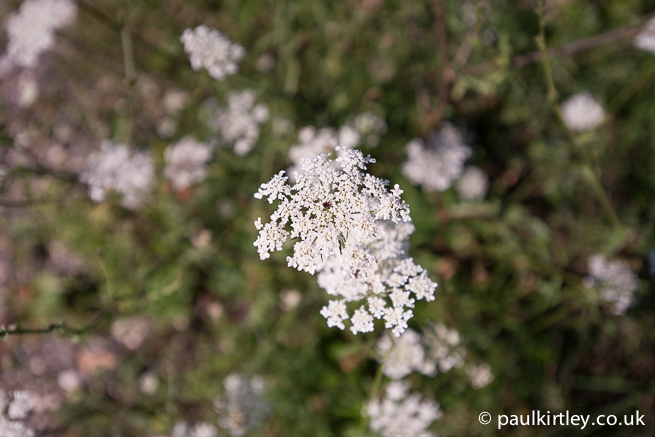 In my part of Austria there is an abundance of Daucus carota, Aegipodium podagraria, Conium maculatum and Pastinaca sativa. Interesting point that the hemlock root resembles the wild carrot. I never dared to uproot one but it is good to know that it is better to make the sniffing test. How do you process the wild carrot? It is very ligneous and fibrous. I cooked it for half an hour but it was still very hard albeit it added a pleasant flavour to my stew. I also tried to roast it on a bed of embers until almost burnt but it wasn’t much better. I very much like to add fresh leaves of Aegipodium podagraria to soups and stews or anything else where I would add parsley. 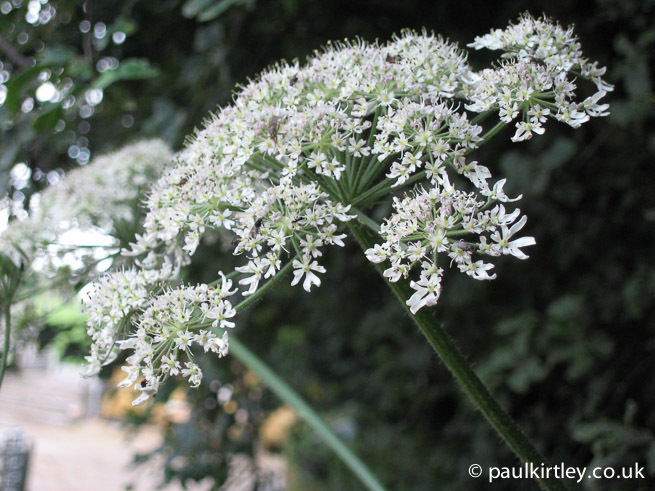 Would like to see Sweet Cicely included in the comparisons – very similar to Hemlock, even more so than Queen Anne’s Lace.